Understanding Garage Doors - 24/7 Garage Door Repair & Installation Raleigh, Cary, Durham, the Triangle. Do you know your garage door? 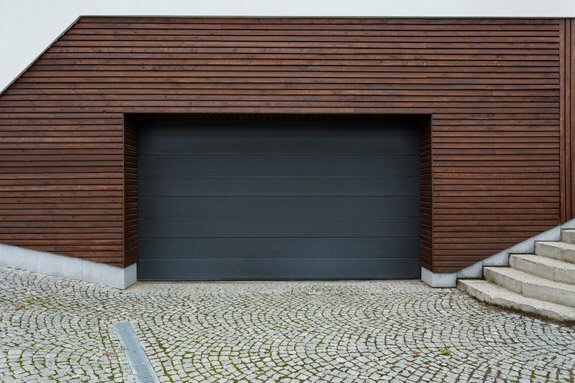 Most people will own only one or two garage doors in their lifetime, but how well do you really know it? Not sure what a lifting cable is or what reinforcement struts do? This overview will help you understand your garage door a little better and know more if you need to make a service call. Garage Doors sold here in North America are sectional doors that glide overhead along the ceiling. The doors are usually four sections of around eighteen to twenty-four inches per section. The general height is between six and eight feet with the widths for single shed doors at four feet and double garage doors up to eighteen. The doors come in insulated or non-insulated with either plastic, polystyrene, or polyurethane insulation o an R rating of between R-6 and R-18. The doors are between 1 3/8 inches to 2 inches thick. Galvanized steel is the most common material for exteriors with wood, fiberglass, and PVC as other options. 1. The tracks are what guides the door vertically and horizontally and the thicker the steel, the less twisting and tilting will happen under normal use. 2. The rollers are what guides the door along the tracks. Rollers are made of either steel, black nylon or reinforced nylon in white. The nylon rollers are quieter of the choices. With the steel rollers, you should know how many bearings there are as the more you have, the better they roll. Rollers should be rolling and not sliding in the tracks. 3. The garage door spring, Also known as the counterweight system, allows you to open the garage door with one hand. The door weighs between eight and ten pounds when properly weighted. There are two kinds of spring systems: torsion, shaped like a coil and inserted in a steel shaft over the door, and extension that is shaped like a coil but placed over the horizontal tracks. These systems have a service life of around five to seven years. 4. The hinges are the joints that let the door bend and retract up along the ceiling. Large doors will require double hinges to hold the door when in the open position and are at the end of the door section. 5. Lifting cables are braided steel wires calibrated to the total weight of the door with larger doors needing stronger cables. 6. Reinforcement struts are used to support double doors when they are open for long periods of time. 7. The garage door opener is the handle used to lift the door. Make sure it is firmly attached. 8. Galvanized steel is used in place of regular steel because of its rust resistance with higher ratings used in more humid areas like around Cary, Durham, and Raleigh areas of North Carolina. 9. The thickness of steel is measured in gauges with the lower values being thicker steel. 18-gauge steel is thinner than 14-gauge. 10. And Finally, The Weatherstripping. Weatherstripping keeps the elements and most debris from entering the garage through small cracks around and under the doors. The stripping should be checked regularly to make sure it’s not cracked or damaged. If it becomes brittle, cracked or damaged, its time to call a garage door technician for replacement. Knowing more about your garage door will help you better understand how it works and when it’s time to call a technician for garage door repairs. Speaking the same language as your technician can help isolate the problem and be more prepared when he arrives.